If your lawn suffers from compaction, poor drainage or is densely infested with moss and thatch, the Bosch AVR1100 Verticutter may just be the tool you are looking for. It is designed to leave multiple rows of incisions in the lawn surface that will open up the grass roots to much needed oxygen and hydration, at the same time cutting cross growing roots and removing lawn debris into a 50-litre collection box. 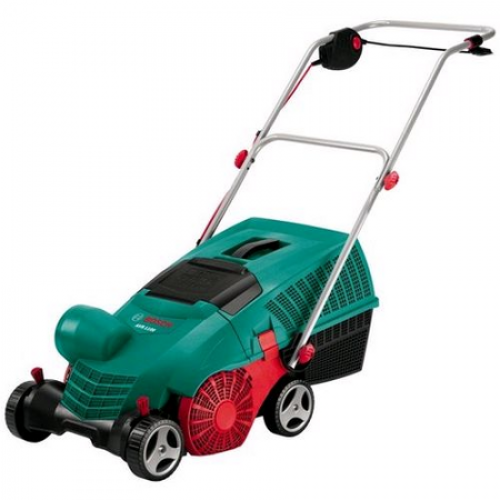 Debris is literally thrown into this collector due to the clever design of the rotating drum; known as the ‘Jet-Collect’ system, loaded with 14 stainless steel blades and with a working width of 32cm, small to medium sized lawns can be treated in a short space of time.